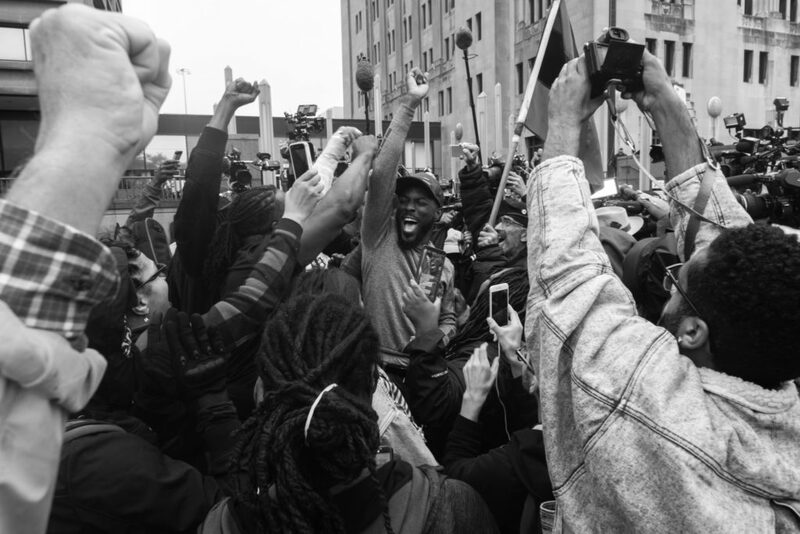 The evening after the Van Dyke verdict came down, Trina Reynolds-Tyler took to Instagram to ask her followers a simple question: “What is justice for Laquan McDonald?” An organizer and abolitionist, Reynolds-Tyler has been involved with activism around the McDonald shooting since before it caught the public’s attention. That night, through her Instagram story, she was able to serve as moderator of a conversation between her followers, posting people’s responses to one another without revealing their identities. “People were saying stuff like, ‘He should be raped, he should be in a cell, [McDonald’s] family should be able to torture him.’…. It [was] an anonymous debate. [So] people are not afraid of saying something and that thing being connected to them,” she said. It’s been just over four years since McDonald was shot, and, this November, three years since the city released video of the murder. It’s about two-and-a-half years since then–Cook County State’s Attorney Anita Alvarez was voted out of office, her re-election campaign doomed in the face of fierce, implacable opposition from groups like BYP100 that claimed she had been involved in covering up release of the footage. And now, it’s been almost three weeks since Jason Van Dyke was found guilty of second-degree murder. It’s tempting to see, in this slow-moving timeline, the deliberate and gradual workings of a system that functions as it should. Elected officials, including Mayor Rahm Emanuel, lose elections or voluntarily leave office. The city pays millions in compensation to Laquan McDonald’s family. Jason Van Dyke is brought to justice and sent to prison, locked up for however long a judge deems appropriate. But for abolitionists like Reynolds-Tyler — many of them connected to organizations that led the effort to bring wider public attention to the McDonald shooting — things are more complicated. Abolition is a complex concept; it means not just the sudden disappearance of prisons and police, but, in the words of Advancement Project lawyer and abolitionist Derecka Purnell, that “society decrease and eliminate its reliance on policing.” In Chicago, Assata’s Daughters and BYP100, as well as a number of arts-oriented collectives, have pushed this idea forward in recent years, often through the creation of separate infrastructure to solve problems that would traditionally be dealt with by police or courts. These organizers think the conviction of Jason Van Dyke is promising, insofar as it shows a willingness by the local justice system to hold police accountable for violence against Black people. But they don’t believe the punishment of a single person solves the fundamental injustice: the existence of the prison-industrial complex, and the structural inequities that support it. That’s complicated, because McDonald’s family has supported the effort to prosecute Van Dyke; a relative said that McDonald’s mother reacted with “relief” and “tears of joy” to the verdict. Plenty of Black people have expressed satisfaction or joy at the guilty verdict. Abolitionists don’t necessarily share these judgments — the ones I spoke with all noted how complicated their thoughts and feelings on the verdict were — but they still want to leave space for other Black people to respond this way. Williams, for his part, described the verdict as burdened by the “spectacle of history”: the frenzy of media attention and political opportunism that came with the case’s high profile. The city added to that spectacle in its own way, very visibly deploying thousands of extra policemen around Chicago ahead of the verdict, with little explanation beyond vague pronouncements about “a responsibility to keep the city safe.” As some commentators pointed out, this move suggests city leaders assumed that largely Black protesters would probably react violently if Van Dyke were found innocent. It’s this paradigm— taking Black criminality as preordained and threatening violence as a legitimate response to Black protest — that abolition aims to overthrow. Editors’ Note: Trina Reynolds-Tyler is a contributor to the Weekly and previously worked in administration for the Weekly. She is also a fellow at the Invisible Institute, an editorial partner of the Weekly. Christian Belanger is an editor at the Weekly. He last interviewed urban archaeologist Rebecca Graff.